Haven't eaten a pesto in years that was as light as this one.. and that's with omitting the sun-dried tomatoes and ricotta... would definitely make again. Recipe suggests 15 minutes marinating - I gave it 3 hours. Very tasty, next time I'll turn the marinade into an accompanying sauce.. 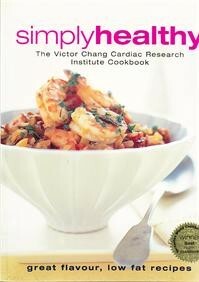 Simply Healthy is the cookbook for lovers of good food, who want to follow a heart-healthy eating plan. As we head into the 21st century, all indications are that heart and blood vessel disease will become the number-one killer, worldwide. The staff of the Victor Chang Cardiac Research Institute has developed this book of modern, easy-to-prepare recipes as part of their continuing commitment to heart health. They invite you to improve your eating habits and those of your family and friends by using it frequently. While primarily a cookbook, it also includes important nutritional information, based on the latest research. The more than 120 recipes include a variety of foods and cooking styles that are sure to appeal to all cooks. However, most importantly, all recipes have been developed with your heart health in mind. For those who need to monitor the intake of certain nutrients, each recipe is accompanied by a nutritional analysis which includes the kilojoule, calorie, total fat, saturated fat and sodium conent of each dish.